Reflect on the past year. Before setting new goals for the next year, it is important to reflect on the past year. When reflecting on the year, think about what you liked about the year and what you’d like to improve or change. Think about what successes you’ve had, whether they have been professionally or personally. What contributed to your successes? Did you have a behavior or lifestyle change, or an attitude change? Did you become more comfortable with with a new skill or role? It may be helpful to categorize the different aspects of your life first, such as family, partner, friends, work, health, and so forth. You can then rate or reflect upon each facet, and see where you feel satisfied and fulfilled, and where you still feel unfulfilled or disappointed. Once you have a sense of which aspects of your life need to be maintained better or improved upon, then you can start thinking about goals. Think long-term goals first. Now that you’ve reflected on different facets of your life, and you’ve come to a conclusion with which aspects that you want to work on, it is time to set-up some long-term goals (long-term meaning for the next year). Where would you like to see yourself next New Year’s? Remember, it is important to be realistic. Do you have an eye out for a promotion at work, or perhaps you want to reconnect with old friends. Imagine what your life would look like if you had achieved these goals, and what about it would look different. Would you be working longer hours at work? Would you be seeing friends more often on the weekends? Would you be going on more date nights with your partner? It is also important to take long-term goals and make them measurable in some way that makes sense to you. Once you have set your long-term goals, it is now time to think about how to achieve them. Take long-term goals and turn them into short-term goals. When you’re aware of what your long-term goals are and what your life would look like if they were achieved, it is then time to look at what you’d like to have achieved in 6 months, or a half-way mark. Once you have an understanding of your 6 month goals, then think about 3 months, then 30 days, then weekly, and so forth. For example, if your overall yearly goal is to be healthier or lose weight, break that down into what that will mean in the short-term. At 6 months, maybe you will have want to accomplish running a 5k or add yoga into your workout routine. If that is a 6-month goal, what do you need to have accomplished in 3 months to achieve that? When you think long-term first, and then break it down into what it may mean for the short-term, it will become less overwhelming and therefore more sustainable. 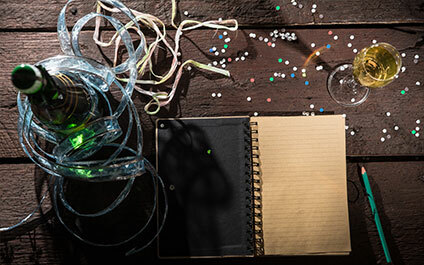 New Year’s resolutions are a great way to facilitate change in our lives. When reflecting on what kind of resolutions you’d like in your own life, think about what would make your life feel more balanced, satisfactory, and meaningful. If you are having trouble staying motivated or feel overwhelmed with how to make positive changes in your life, it may be useful to make an appointment with a therapist. Start your 2017 off to a healthy and positive start by contacting Symmetry Counseling to set up an appointment with an individual, couples, or family therapist.